Simon's, also known as J. Benjamin's is that highly revered, well kept secret of a restaurant you've been looking for. Come visit us today, and find out what people are talking about. Reservations available for tables of six or more. No call ahead seating. Four slices of garlic-buttered italian bread, topped with mozzarella cheese. Hand-dipped, hand-coated rings made from scratch. Our artichoke dip has no spinach & plenty of parmesan. A must try if you've never had! Served with toast points. Combination of button & portabella mushrooms sauteed with butter & garlic rosemary then dusted with parmesan chees. Served with toast points. Ricotta, mozzarella, & parmesan cheese combined with diced jalapeños & bacon bits give this an original taste with a kick. Toast points topped with balsamic vinegar soaked tomatoes, garlic & basil topped & baked with mozzarella. Feta cheese drizzled with olive oil & baked golden brown. 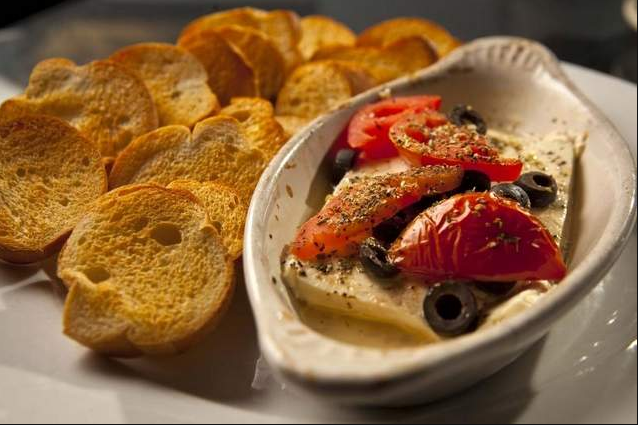 Topped with black olives & tomatoes, served with toast points.